One unquestioned benefit of hormone replacement is the preservation and restoration of bone density. In our experience, it is possible for most patients to raise bone density without bisphosphonates (Fosamax, Boniva, Actonel, Zometa), with the use of specific supplements and hormones. Both estrogen and testosterone improve bone density. Higher doses have a greater effect, but lower doses will still be effective. Spine bone density tends to improve more rapidly than hip bone density. Bisphosphonate drugs may cause fractures of the hip bone, destruction of the jawbone, and esophageal problems including trouble swallowing. By far the most effective method of hormone replacement for increasing bone density is implantation of hormone pellets. This is because the pellets release a constant amount of hormone throughout the day, every day, for several months. There is no fluctuation of hormone levels. In one woman who had previously been using transdermal hormone creams, bone density increased over 10% in the lumbar spine, 15 months after changing to pellets. DEXA bone density testing is the most accurate way to determine the presence of osteoporosis. It employs very low dose x-ray to assess bone thickness in the hip, lower back, and wrist, the primary areas at risk for fracture. Insurance permits testing every two years after menopause, and every year if osteoporosis is found. 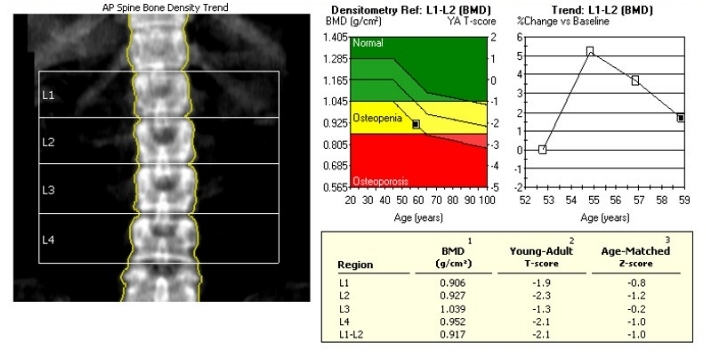 A T-score (a correlation with age of maximal bone density) of -2.5 or lower determines that osteoporosis is present. All women should have bone density measurements by the age of 50. A woman should have bone density measurement at the time of menopause, or earlier if she has a fracture of the hip or spine, premature or surgical menopause, inflammatory bowel disease, treatment with steroids, or a family history of osteoporosis. Very thin women and light-skinned women have a higher risk of osteoporosis. Overweight and obese women have a lower risk. Bone density in men also responds to hormonal changes. All men with osteoporosis, with height loss, or history of vertebral, hip or wrist fracture, should have DEXA bone density testing. If bone density is low or low normal, the testosterone level should be obtained. Total testosterone below 320 ng/dl justifies treatment with testosterone. Again, pellets are the most effective method of hormone administration, but sublingual, transdermal or intramuscular preparations are still effective. Bone density should be retested every year until a desirable result is achieved, and every two years after that. Vitamin D: blood levels of 25-hydroxy vitamin D should be around 50. Doses vary by patient to reach optimum levels. L-arginine or L-Citruline: amino acids likely to raise bone density by increasing production of nitric oxide in the body. Intake of about 2000mg /day. The specific form and the overall quality of nutritional supplements makes a big difference in their effectiveness. At IPM we use the highest quality, pharmaceutical grade nutrients in the proper therapeutic ratios and in the most effective forms. The best exercises to raise bone density are weight-bearing and resistance training. Bicycle riding seems not to be effective. We routinely employ all lifestyle measures to improve bone density and add hormones unless there are contraindications. Older individuals still benefit from hormone supplementation to support bone density.